MEXICO CITY (CNS) — Clergy from the Archdiocese of Managua, Nicaragua, had planned to pray for peace June 21. Instead, bishops from the archdiocese, Archbishop Waldemar Sommertag, apostolic nuncio to Nicaragua, and about 30 priests from the capital traveled to pray in the besieged city of Masaya. The city has been the site of protests against the country’s unpopular president, and police and paramilitaries have been accused of attacking and killing the civilian population. “I want to make a call to those who have come to this city to kill, I want to make a call to those that are sharpshooters … I want to make a call to (President) Daniel Ortega and (Vice President and first lady) Rosario Murillo, not one more death in Masaya,” Auxiliary Bishop Silvio Baez Ortega told locals outside St. Sebastian Parish. The churchmen celebrated Mass and led a eucharistic procession through city streets, passing through barricades and the scenes of past attacks while praying to the Jesus in the Blessed Sacrament. Church bells in the city tolled to welcome them, a change from the sounding of the bells to warn the population of arriving police or paramilitaries. 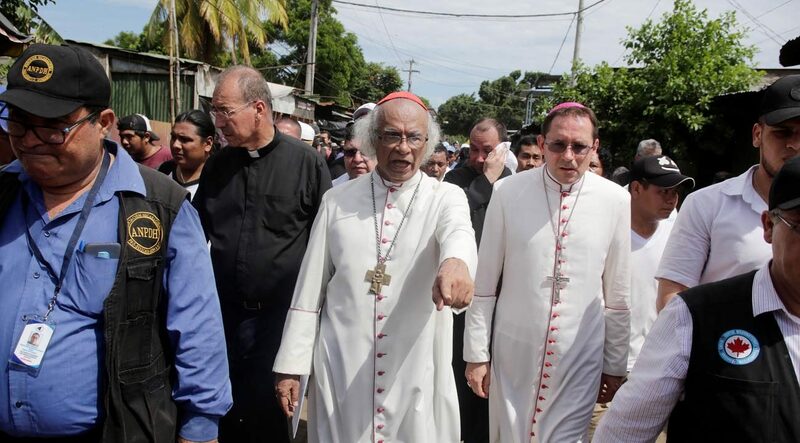 Cardinal Leopoldo Brenes Solorzano of Managua entered the police command post and spoke with a commissioner accused of directing attacks on the civilians. He also delivered a list of detainees he wanted released. The commander promised to stop the attacks, but Cardinal Brenes promised to “call again” if he did not comply. Riot police had been sent to Masaya earlier in the day, but “when they knew that the bishops were going there, they withdrew,” said Father Victor Rivas, executive secretary of the Nicaraguan bishops’ conference. Violence has convulsed Nicaragua for two months as citizens protested a proposed reform to the country’s social security system. Demonstrations were met with police repression, but spread rapidly as demands increased for the ouster of Ortega and Murillo. More than 200 deaths have been recorded in Nicaragua since April 18, according to observers and human rights groups. Priests in Nicaragua have provided moral and spiritual support for protesters and the population, Father Rivas said, adding they had acted as mediators, intervening in the cases of those disappeared and allowing churches to be used to treat the wounded. The Nicaraguan bishops’ conference has convened a national dialogue, but talks have faltered because of a lack of consensus. To end the crisis, the bishops’ conference has proposed holding elections in April 2019 and replacing members of an electoral authority considered pro-government. “They’re the guarantors of that right now because they’re the only institution in the country that people believe could be impartial,” said Rick Jones, Catholic Relief Services’ deputy regional director for Global Solidarity and Justice for Latin America and the Caribbean.